On behalf of the Governor General, the Lieutenant Governor presents awards and honours under the Canadian Honours System to deserving British Columbians. 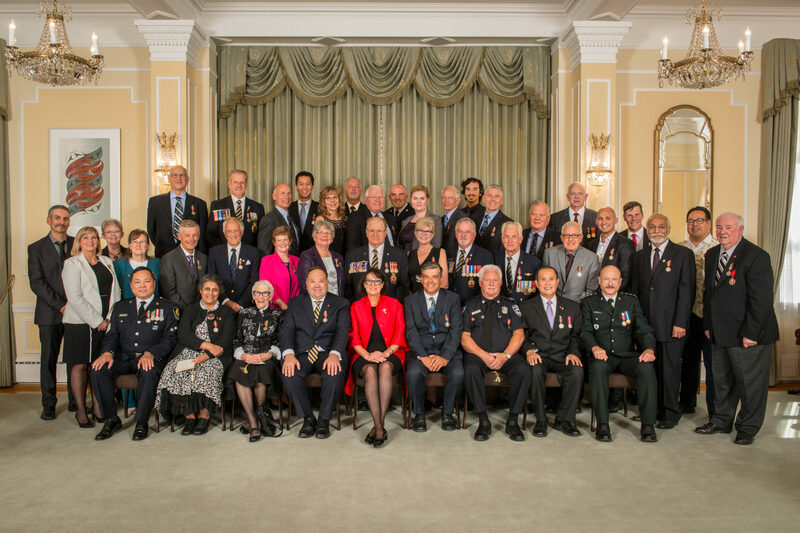 These Orders, Decorations and Medals recognize outstanding citizens who have demonstrated excellence, courage or exceptional dedication to service in ways that bring special credit to British Columbia and the nation. Recipients of awards under the Canadian Honours System must ensure the insignia is worn in accordance with the rules established by the Chancellery of Honours. Orders recognize notable accomplishments and remarkable service. The centrepiece of the Canadian Honours System is the Order of Canada. It was established in 1967 by Her Majesty Queen Elizabeth II and recognizes a lifetime of outstanding achievement, dedication to community and service to Canada. Since its creation, over 675 British Columbians have received the Order of Canada. Other Orders under the Canadian Honours System include the Order of Merit; the Order of Military Merit; the Order of Merit of the Police Forces; the Royal Victorian Order, and the Most Venerable Order of the Hospital of St. John of Jerusalem. While provincial orders are not part of the Canadian Honours System, they have precedence in the Canadian Order of Precedence of Orders, Decorations and Medals. As the Chancellor of the Order of British Columbia, the Lieutenant Governor presents the Order annually to a small group of deserving individuals. The Order of British Columbia is the highest form of recognition the Province can extend to its citizens. It was established in 1989 to recognize people who serve with great distinction and excel in any field of endeavour which benefits the people of British Columbia or brings special credit to the Province. To date, over 330 British Columbians have been invested into the Order of British Columbia. Normally presented at Rideau Hall by the Governor General, Decorations recognize various degrees of bravery, professionalism and exceptional devotion to duty. They are divided into three categories: Military Valour Decorations, Decorations for Bravery and Meritorious Service Decorations. Over 490 British Columbians have received Decorations. Medals are a tangible way to acknowledge general service carried out with distinction by Canadians; to commemorate special occasions; to celebrate important anniversaries; or to recognize long-term exemplary service. The Lieutenant Governor regularly presents Exemplary, Long Service and Commemorative Medals to British Columbians. Created in 1999, the Vice-Regal Commendation and Commissioners’ Commendation is presented by the Governor General, the Lieutenant-Governors of the Provinces and the Commissioners of the Territories respectively for long-term or outstanding service to the Office of the Queen’s representative or Territorial Commissioner. The recipients have either served on staff (paid or volunteer) during an incumbent’s mandate in a commendable fashion; or the recipient has performed one or more outstanding acts as a member of the incumbent’s staff (paid or volunteer) that has benefited the Office of the Queen’s representative or Territorial Commissioner.